If you could put all your energy into what’s most important to you every single day, what would your life look like? Would it look anything like your present-day real life? If the two scenarios look more different than similar—if they look like two separate worlds—it may be time to reprioritize. A time-tested tool for doing just that is known as a “life wheel.” These can be powerful for helping you refocus when you’re feeling off-balance. They give you a space to examine the most important areas of your life and help you restructure how you use your time and energy. Life wheels have been around for a while, and there are many versions of them out there. They all split the areas of your life into different dimensions, as seen below. Download and print the Xenium Life Wheel. Choose your lens. You can use your life wheel to look at an overview of your life in general, or to take a deeper dive into smaller subsets of your life. For instance, you could decide to look at specific areas of your professional or personal life in more detail. Assess how you’re doing in each area, scoring them from 1-10, based on how much attention you currently give them. Plot these scores on the life wheel. Now it’s time to analyze! From these numbers, you can clearly see where you are focused and where you’re not paying enough attention. Consider where you would like to be in each area and know that a 10 might not be realistic across the board. You may even find that you have been far too attentive to certain areas and would prefer to spend less time on them. Brainstorm specific and timely ways you can improve your prioritized areas. Coming up with actionable goals will help you in your next step. Take action! Incorporate your goals into your everyday life. You might find it helpful to review these goals each morning when you wake up, or you could keep them posted somewhere where you’ll see them often, like on your refrigerator or your desk at work. Finally, be sure to check on your progress in a few weeks or a few months. 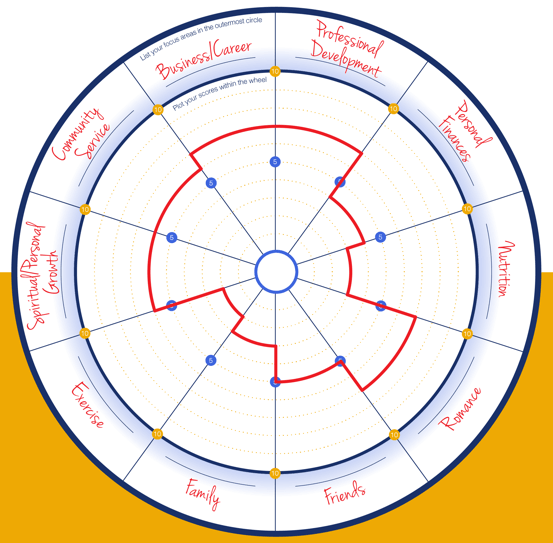 See if you have created a more balanced life wheel or if you need to make some more goals to help you get there.